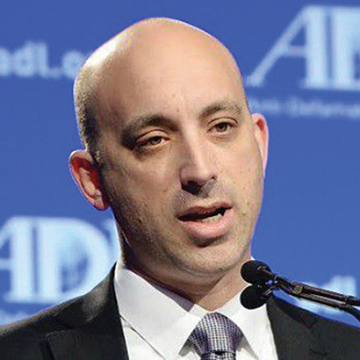 Jonathan Greenblatt, the new national director of the Anti-Defamation League, will make his first visit to New Orleans in March for two addresses. He will give a keynote address on March 17 at New Orleans Entrepreneur Week, at 11 a.m. at The Chickory. On March 16, he will speak on “Anti-Semitism and Justice for All: Because the Work is Not Yet Done,” at the home of Leann and Ted Moses. Because of limited space, reservations for the 6 p.m. program are requested. Greenblatt became director of ADL last summer after Abe Foxman retired. Foxman had led ADL since 1987. Prior to heading ADL, Greenblatt served in the White House as Special Assistant to President Obama and Director of the Office of Social Innovation and Civic Participation. There, he led the Administration’s efforts to use financial innovation, national service, and public-private partnerships to accelerate economic recovery, boost job creation, and strengthen local communities. Jonathan also founded All for Good, the open data platform designed to enable more people to serve. Launched with support from Google, AFG has emerged as one of the largest databases of volunteer opportunities on the Internet. He also served as CEO of GOOD Worldwide, a diversified media company. He co-founded Ethos Brands, the business that launched Ethos Water, the premium bottled water that helps children around the world access clean water. Ethos Water was acquired by Starbucks in 2005, and Greenblatt then became Starbucks’ vice president of global consumer products and joined the board of the Starbucks Foundation. As an undergraduate at Tufts, Greenblatt interned in ADL’s New England regional office in Boston, and he is a graduate of ADL’s Salvin Leadership Program. His wife is an Iranian-American who came to the U.S. as a political refugee and worked as an associate director in ADL’s Pacific Southwest regional office in Los Angeles for nearly eight years.